Distillation is the process of boiling a liquid and then re-condensing the vapors into a more pure liquid. This process is often to remove impurities in liquids intended for drinking or laboratory use. It is most commonly used to purify water and ethanol. Water is used in many different fields. In many of them the water they use must be pure. Ethanol is distilled to use as a cleaner or in drinks. Distillation has been used in many contexts. Everything from illegal activity to provision. During the 1920s it was used to keep alcohol in the hands of the general public during the prohibition. In other countries it is the main source of alcoholic drinks. Distillation can be used for good or for bad. Either way it is an interesting process. In basic terms, distillation is the process of heating water or another liquid to a boil and cooling the resulting vapors. The main apparatus needed for distillation are a round bottomed flask, a three pronged clamp with holders, ring stands, ring clamps, Y adapter, a condenser, versatile clamp, boiling chips, a stemmed funnel, a thermometer, steam bath, and tygon tubing. The first step is to gather your materials and begin setup. Place the ring clamp and the three pronged clamp on the ring stand and put the round bottomed flask in the three prong clamp. 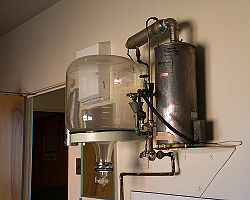 Place the Y adapter in the opening of the round bottomed flask and connect the Y adapter to the condenser. The condenser connects the Y-adapter to the rest of the apparatus. Use a clip to connect the condenser to the Y-adapter. Use the versatile clamp to connect the condenser to the ring stand. Using a clip connect a vacuum adapter to the condenser and drop a couple boiling chips into the Y-adapter. Next, add the liquid that is going to be distilled and clamp the top and place a thermometer in the top. When the complete apparatus is assembled, the liquid needs to be boiled. Using a hot plate or a Bunsen burner heat the liquid to its boiling point. Once the liquid has boiled and is converted to vapor, the vapor will need to be cooled and the resulting liquid is the distilled form. The complete apparatus needed to preform distillation. The most frequent uses of distillation are of water and alcohol. Water in its natural state has dissolved elements in it such as iron and calcium, the easiest way to get rid of the contaminants are to distill it. Since most of the time this is done on a large scale there are machines that use distill water on a larger scale. The other common use of distillation is of alcohol. The most common alcohol that is distilled is ethanol. The process of distilling ethanol and water are identical with one difference. the boiling temperature of water is 99.974 C and ethanol boils at 78.4 C. This means that it will take more heat to distill ethanol than it will to distill water. There are 3 basic types of distilled ethanol. These variants of distilled ethanol are usually called "stills". The First type is called a pot still. This is made by putting boiling ethanol into a pot that collects the vapors released by the boiling mash. This method results in 40-60% purity and a good flavor. The ethanol can be put back into the pot to increase the purity to 70-80% but deducts from the flavor. The second type of still is a reflux still. This method requires a column with some packing in it. This generates reflux liquids. These liquids clean the alcohol and increase the percentage of purity. This method also generates drinks that can be mixed with other flavors easily. The third common type of still is a fractionating still. This type generates the most pure alcohol of the 3 still types. This method is similar to a reflux still, only instead of a small narrow column, this has a large column usually 2-4 ft high. This column needs to be packed with a material with a large surface area. These three types of stills are most commonly used for making homemade alcoholic beverages. In the United States it is illegal to distill alcoholic beverages without a license. When ethanol is converted to a drinkable from it is called moonshine. Moonshine was very common during the 1920s during the prohibition. moonshine is made by using a sugar source to produce ethanol. The product is used for drinks and even is developed into bio fuel. When moonshine is consumed as a drink it can be very dangerous. consuming too much of it can result in blindness and even death. An old trick to test whether or not moonshine is safe for drinking was to light it on fire and if the flame was blue it was safe to drink. That trick has proved to be ineffective. When people die from consuming moonshine it is commonly from ethanol poisoning. This is very common among alcoholics. When alcohol is consumed faster than the kidneys can filter and the persons blood alcohol level is above .40%, half of people will die. This makes moonshine just as dangerous to drink as any other alcoholic drink. When moonshine was made improperly it had very serious effects. When one drank a “bad batch”of moonshine it caused blindness, paralysis, hair loss, and death. These effects were caused by consuming too much ethanol. One would experience similar effects after consuming anything that has a high concentration of ethanol. Another risk one took when drinking moonshine was, during the fermentation process, which was usually done in the woods, sometimes small insects or leaves would fall into the solution. This could cause one to experience extreme discomfort. The last risk was that sometimes when people would make it they would add toxins and sometimes even human feces to speed up the fermentation process. Drinking this contaminated moonshine usually resulted in the normal problems relating to drinking toxins. One would take a pretty big risk every time they would drink some moonshine. One of the main things that people identify homemade alcohol with is the prohibition. This term describes the period that the United States had outlawed any type of alcoholic drinks. By 1916 23 of 48 states had already banned alcohol. Alcohol was completely outlawed by the Senate in 1917 by the 18th amendment of the Constitution. This amendment prohibited the production and sale of any type of intoxicating liquors. At first the public seemed to be open to this change, but soon it was common to see people carrying hip flasks with bootlegged whiskey in them. Soon they even had secret places that they could purchase imported liquor. Since the imported drinks were expensive people soon began to look into making their own spirits. This is when “moonshine” made its debut. Moonshine describes any type of homemade alcoholic drink. The most common type of moonshine that was made during this time was whiskey. Soon, moonshine went from being a private practice to a major industry. The most notorious of moonshine distributors were the gangs. One in particular was Alphonse “Scarface Al” Capone. Soon government saw that the prohibition was causing more problems than it was solving so, in 1933 the amendment was appealed and removed leaving liquor control in the hands of State government rather than the Federal government. This page was last modified on 3 March 2015, at 15:31.